While the U.S. stock market in general has been bounding higher, the energy sector has been dragging its feet a bit. It's not the worst performing sector of 2019, but it hasn't been able to keep up with the technology, real estate or industrials sectors. Crude oil prices seem to have kept the energy sector from enjoying growth of the same magnitude as its more successful peers. However, if crude oil prices can continue climbing like they are, energy stocks may start striking it big once again. 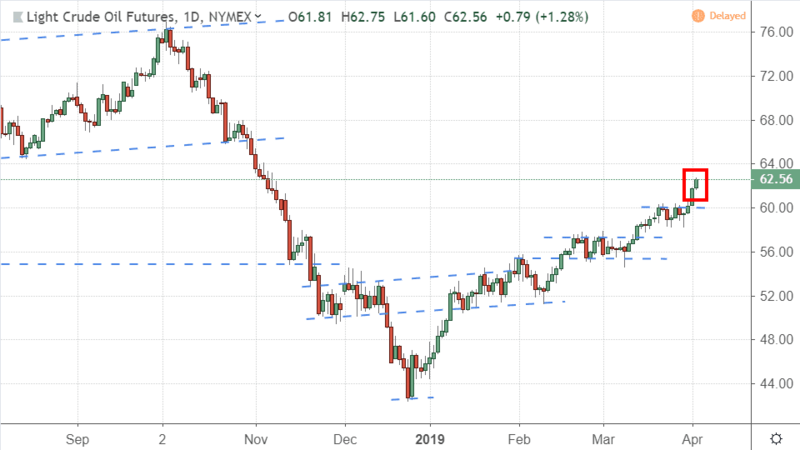 Crude oil prices bottomed out with the stock market on Christmas Eve 2018 at a low of $42.36 per barrel and have been rising consistently ever since. Investors seem to be revising their global economic growth estimates higher, and this is creating bullish pressure on the demand side of crude oil's supply-and-demand equation. But what about supply? 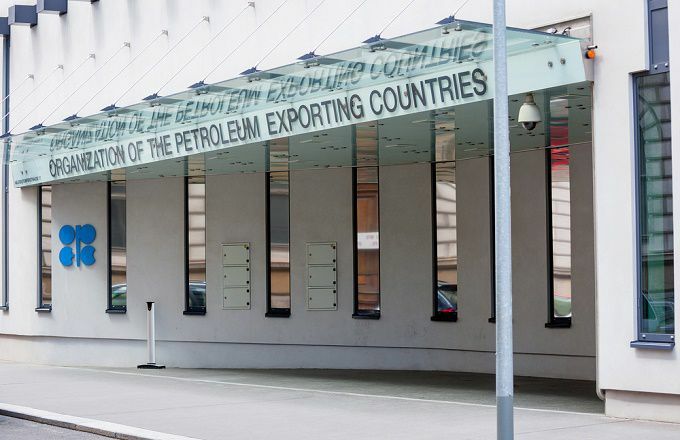 Until two days ago, crude oil had been stuck below resistance at $60 per barrel for the better part of two weeks as investors waited to see how much oil members of the Organization of the Petroleum Exporting Countries (OPEC) produced in March. Once the numbers came out, investors pushed oil prices higher. Saudi Arabia's cut, coupled with declining production from fellow OPEC members Venezuela and Iran, tipped the supply side of the equation far enough to send prices up through resistance at $60 – with crude oil closing at $62.56 per barrel, its highest price since Nov. 7, 2018. Crude oil still has a long way to go before it reaches its 2018 high of $76.90, but the commodity's steady trend higher should continue to help independent oil producers, like Devon Energy Corporation (DVN), Hess Corporation (HES) and Cabot Oil & Gas Corporation (COG). 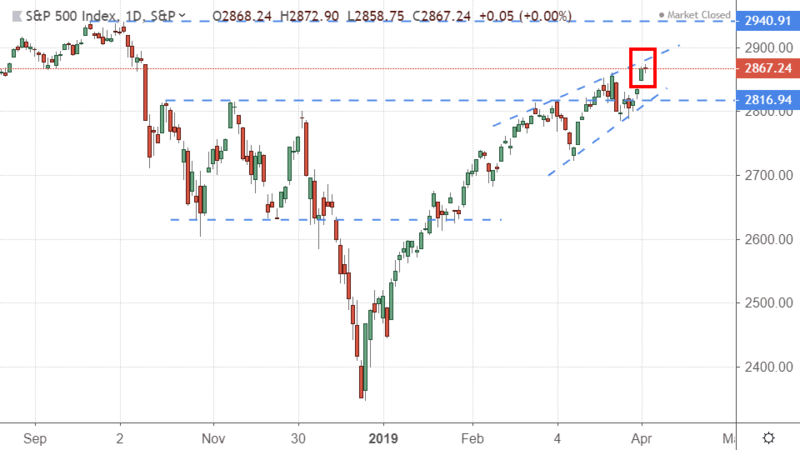 It has been difficult to get the S&P 500 to make a multi-day bullish commitment within any given week during the past two months, and this week doesn't appear to be any different. After jumping to new highs on Monday, the index didn't do much today. It was able to eke out a new intra-day high of 2,872.90, but it only closed 0.05 points higher today, at 2,867.24, than it did yesterday. The spinning top doji formed by today's candlestick is a sign of indecision and can indicate the end of a bullish move, especially when it appears near an established resistance level – like the uptrending level you can see on the chart – but we will have to wait until tomorrow for the candlestick chart to give us a confirmation day before we can determine if resistance is going to hold. One of the questions investors have been asking themselves the past few months is whether emerging markets were going to join in on the bullish run of 2019 – indicating a general strengthening of the global economy and global investor sentiment – or if the resurgence was going to be felt primarily in the United States. While it is still an open question for many emerging economies, investors no longer have to wonder about India after today's rally. 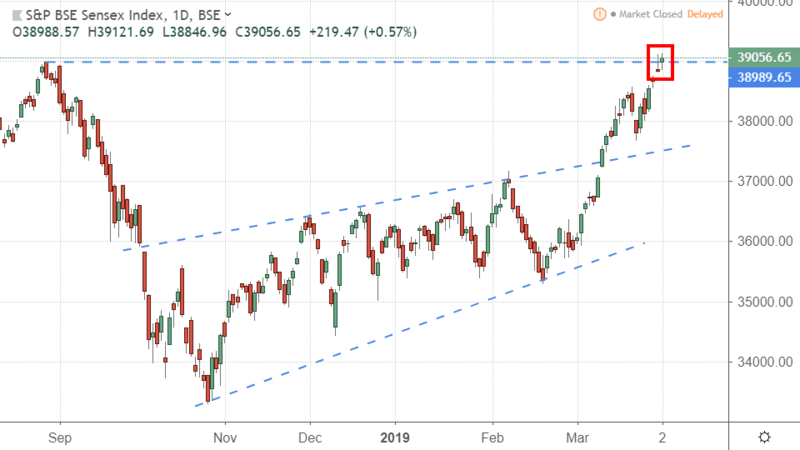 India's S&P BSE Sensex – which includes just 30 stocks, similar to the Dow Jones Industrial Average in the United States – climbed to a new all-time high of 39,056.65 today, breaking above its previous high from August 2018. Much of the bullish momentum behind S&P BSE Sensex components – like Reliance Industries, Tata Consultancy, HDFC Bank and ITC – seems to be coming from investor confidence that Prime Minister Narendra Modi is going to retain power in elections that start later this month. Modi has kept investors happy with many of the reforms he has made since his election in 2014, and these same investors seem to believe that he is going to continue doing the same in the years to come. According to Goldman Sachs, foreign investors poured more than $4 billion into Indian stocks last month, and more is likely on the way. Seeing foreign investors moving money into emerging markets, like India, is a positive confirmation of the bullish market in the United States. Typically, the U.S. stock market outperforms emerging markets during periods of global economic slowdown and underperforms many emerging markets during periods of global economic growth. Seeing Indian stocks reaching new all-time highs tells us that investors don't believe the global economy is done growing. The little market that could just keeps chugging along as investors continue to see signs of potential strength in a global economy that is no longer growing as quickly as everyone would like it to.